Should your business be using Google's Chromebooks? Can you commit to the cloud-based laptops? They don't boot up a real operating system. They don't even run any apps at all, and many of them are meant more for consumers than a business user. Yet, the Chromebook is encroaching on the enterprise, one laptop or convertible notebook at a time. For anyone thinking of deploying these "light" notebooks that boot directly into the Google Chrome browser in a business setting, here are some pros and cons to consider. 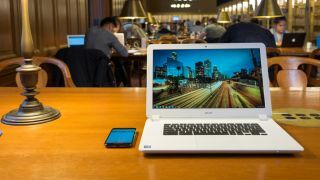 There's no question a Chromebook is a good match for a certain type of corporate employee, one who relies mostly (or completely) on the cloud for data storage and web apps for productivity. There's no reason to have local storage and desktop apps. "If the explosive growth of Chromebook in the education space is any indicator, the potential for rapid Chromebook adoption among business users is very strong," says John Russell, a product manager at Dell. "Chromebooks are appealing to businesses of all sizes due to their mobility, ease of use and affordability. Chromebooks are a great option for people who primarily work within the Chrome OS and cloud-based environment." Brian Rehg, the CEO of Blue Stingray Digital Agency, who uses a Chromebook to do development work, says a low-cost model like the Acer Chromebook he owns is a good match for the low-cost nature of doing work in the cloud. For smaller companies, there are fewer barriers to entry – such as a costly infrastructure, local servers, and management tools. A Chromebook matches up with that low overhead startup mentality. Kamesh Ramalingam, a Senior Product Manager at Acer America, made several good points about how the Chromebook is a good match for a specific type of user. Chrome OS is highly centralised in the sense that there is not much the end-user can do to load local apps. For real work, IT handles all of the cloud-based storage and provides cloud-based apps. For productivity, Ramalingam says there are key advantages in a fast boot time when the worker needs to quickly access web apps. Also, Chromebooks meet the multi-user sign-in capability required in many companies so multiple employees can use the same device.